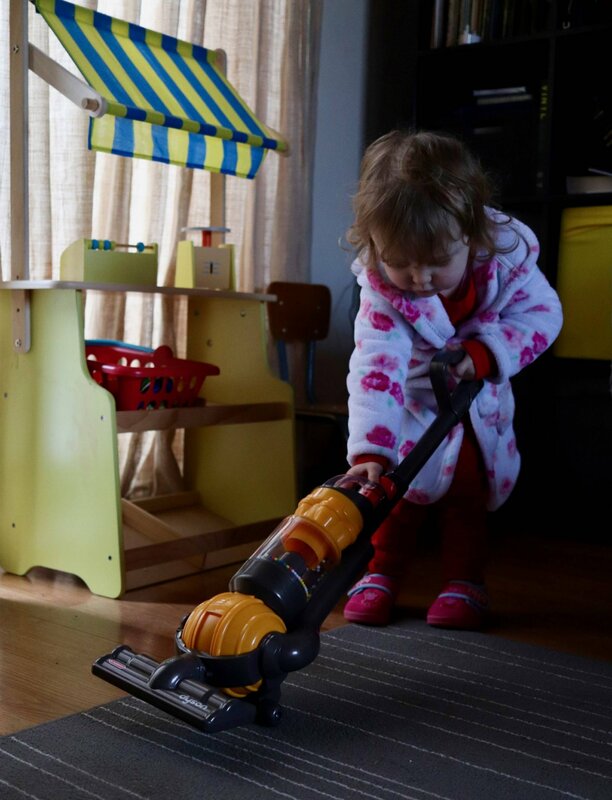 Luisa will be 3 in May so I think it’s about time she started earning her keep. In all seriousness she’d a bundle of energy with endless questions so, for my own sanity, I need to keep her busy. 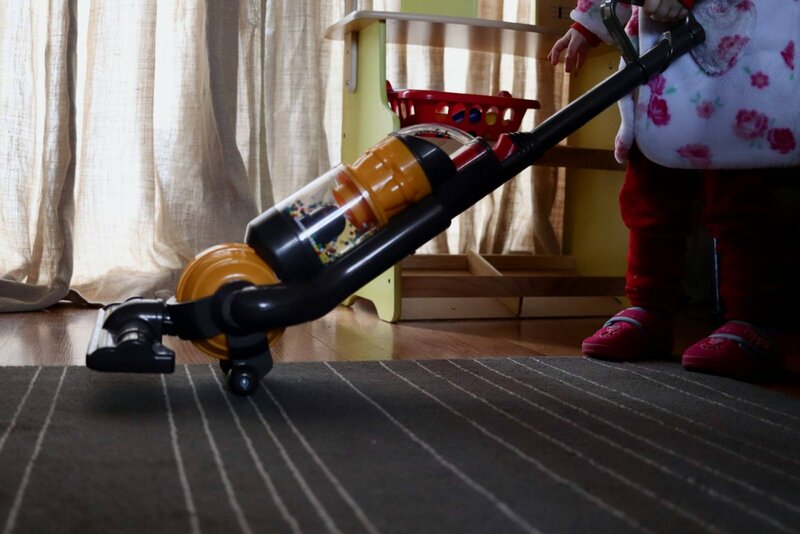 Casdon recently offered us the opportunity to review the Dyson Ball Vacuum, it’s a direct replica of the latest ball model featuring both sound effects and suction to make it even more realistic. I knew Luisa would love it as she really enjoys role-play. We’re forever setting up shops, tea parties, Drs surgeries and the like. 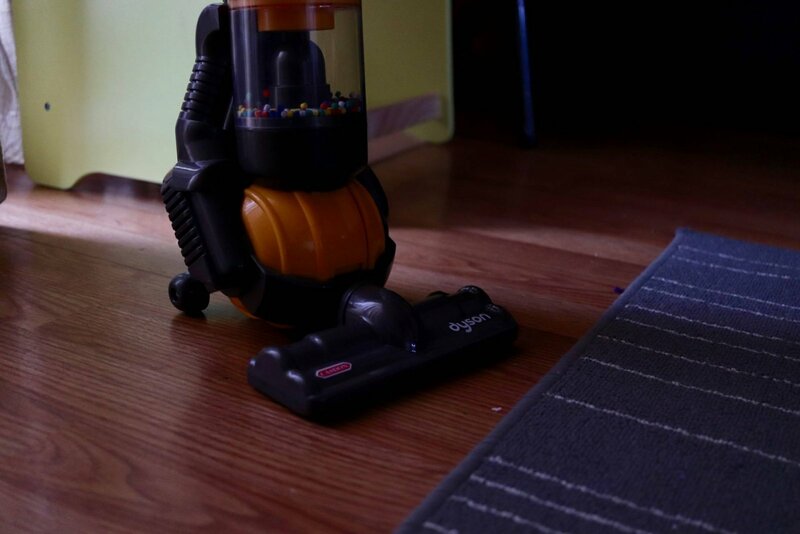 The Dyson comes in two pieces which you slot together, a little force is required and it’s super sturdy once it’s together. As you’ll see there are two switches – a ‘master switch’ on the back and a red button on the front which starts the pretend cyclone action within the cylinder. Luisa loves to see the colourful balls flying around, I think they really add to the whole experience and make it feel very immersive. Side note – you’ll need four ‘C’ batteries to operate it, we did not have these in the house and Luisa was greatly displeased! We’ve had the vacuum for a few weeks now and she is starting to get the hang of the action needed to lock it in an upright position and can turn it on and off by herself so it’s definitely already helping her coordination. 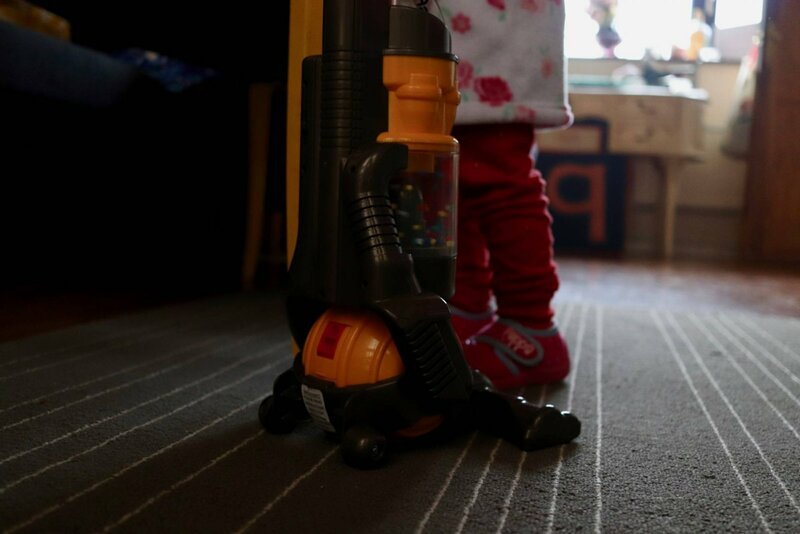 The Dyson Ball Vacuum is suitable for kids aged 3 – 8 years, I think it’s been just perfectly designed because it is small enough that Luisa can manoeuvre it properly at almost 3 but it looks the part. What I mean is, it’s not a babyish replica like some role play toys can be. I feel like it’s working well with my plans to help get her more involved around the house. Lu so desperately wants to join in and do everything Matt & I do but like most toddlers she can get frustrated when she tries to do grown up things and it doesn’t work out. Asking her to whizz round the living room with her Dyson whilst I put all the toys away turns tidying up into a joint activity. 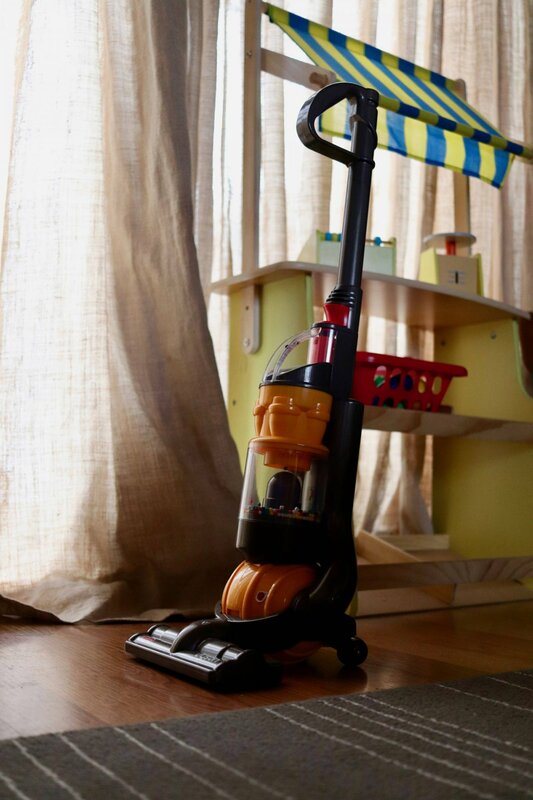 Also, as if a happy toddler wasn’t good enough… The Dyson actually works! It has a small compartment for collecting waste, Lu needs help to remove it but she’ll be able to do it by herself as her coordination and strength increases. The RRP for the Casdon Dyson Ball Vacuum is £17.99, you can purchase it from various shops such as Argos or online via Amazon.